PHILADELPHIA — With a new NFL season kicking off, it appears the standstill on the league’s national anthem policy will remain in effect for Week 1 if not the entire season. Implementation of the new policy, approved by owners during a league meeting in May, has been on hold since word emerged in July that the Miami Dolphins, in paperwork that teams are required to file with the league, revealed they were considering suspending players a maximum of four games for violating the revised rules. Although owners and the NFL Players Association had been in discussions about the policy privately since the union (earlier in July) filed a grievance challenging recent changes, the sides publicly revealed their joint efforts after the league encountered a fierce backlash on social media about the potential punishment the Dolphins may mete out. Leon Bridges sings the national anthem. The NFL and NFLPA have agreed not to comment on the situation, but the sides have developed a good working dialogue, according to people familiar with the discussions. The NFL, the union believes, has been earnest in discussions with players who have protested, trying to understand what it can do better to support players on issues that are most important to them and communities of color. Last month, DeMaurice Smith, the union’s executive director, intimated that maintaining the status quo could be best for both owners and players. “I don’t believe we should have a drop-dead day” to reach a decision on the policy, Smith told The Undefeated. “These are intractable issues that players feel passionately about. It’s issues of race. It’s issues of inequality. It’s issues of criminal reform and social justice reform. Now, I certainly understand the mentality of some people in the league who think that things should begin and things should end. There should be order. There should be control. A little more than two years ago, former San Francisco 49ers quarterback Colin Kaepernick began the demonstrations when he first sat and then kneeled to shine a light on institutional racism and the shooting of unarmed black men by police. Kaepernick, who has gone unsigned since the end of the 2016 season, is battling the league in court. Through a grievance he filed in October 2017, Kaepernick alleges that owners have conspired to keep him out of the league. Last week, an arbitrator ruled the case will advance to a full hearing, denying the NFL’s request to shut down the passer. Kaepernick, and the anthem policy, will loom even larger on Thursday night, when Nike will air an ad during the game featuring him. From the moment Kaepernick first protested peacefully, and thereby began a new civil rights movement in sports, owners have struggled to address the most divisive issue facing professional sports’ most successful league. Initially, some owners pushed commissioner Roger Goodell to change the previous wording in the league’s game operations manual that required players to be on the field for the anthem but dictated only that they “should” stand. That wording enabled dozens of players to demonstrate without fear of facing disciplinary action. In May, owners, without input from the NFLPA, voted to make significant changes to the policy. Beginning this season, the new policy was supposed to require players to stand if they are on the field during the performance, but it gave them the option to remain in the locker room if they preferred. Clubs were supposed to be subject to a fine if a player or any other member of an organization failed to show respect for the anthem. Players were no longer allowed to sit or kneel. 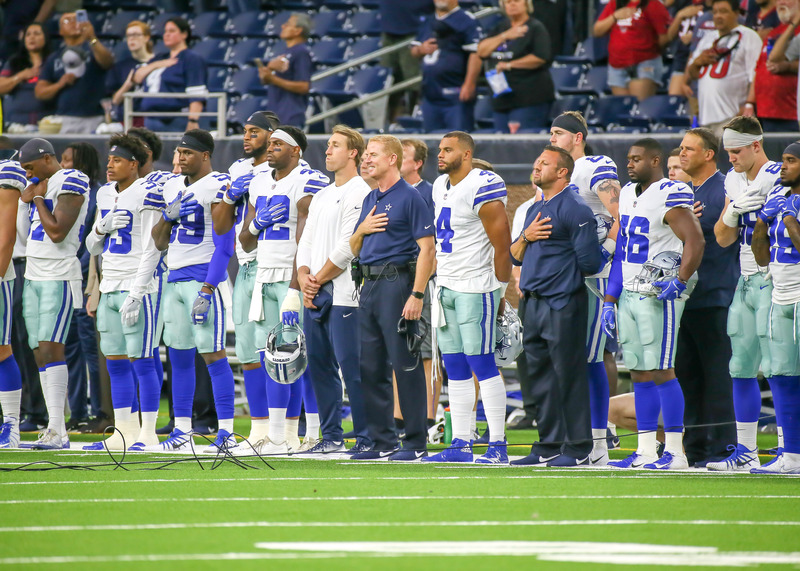 Despite the standstill, in July, Dallas Cowboys owner Jerry Jones said all Cowboys players must stand on the sideline during the anthem, defying the new NFL policy that Jones voted to approve. Jones’ edict could be tested by Cowboys players when the team opens on the road Sunday against the Carolina Panthers. It is unclear what Jones, who reportedly was told by the league to stop talking about the anthem policy, would do if he is defied. Even if the policy approved in May is ever implemented, the New York Jets and New York Giants have already said they won’t discourage players from protesting. Support for the demonstrators falls starkly along racial lines. But some polls indicate the majority of the country views kneeling as inappropriate. President Donald Trump continues to involve himself in the process. Through his Twitter account, Trump has bullied the NFL, pushing owners, none of whom are African-American, to crack down on protesters, even suggesting they should be kicked out of the country. Despite acknowledging that there are external pressures on the process, Smith, in his August interview with The Undefeated, signaled optimism about the league and the union ultimately reaching a workable outcome.